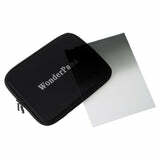 • Provides the ability to mount a variety of 186mm filters and more! With a selection of different custom lens mounts, plus over 15 different filters, there is a perfect creative combination for any photographer or videographer. We offer 186mm round circular polarizer filters, neutral density ND4-1000, and a selection of 8" soft and hard edged rotating square gradient filters. 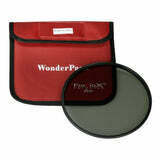 The WonderPana XL 186 Core Filter Holder is a dedicated holder for attaching 186mm threaded filters and caps to this ultra wide-angle lens that lacks front threads. The holder is also compatible with the optional WonderPana XL 8" Holder Bracket for attaching 8"-wide rectangular filters. The 186 Core Filter Holder has a rigid all-metal construction and attaches directly to the lens barrel for a secure fit that does not affect lens performance. Additionally, the holder extends beyond the lens's integrated hood to provide additional protection against bumps and impacts. 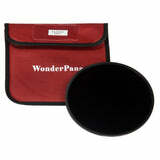 Included with the holder is a 186mm lens cap and soft pouches for storage. • If you want to mix round and graduated filters and rotate them to set the horizon line wherever you want, this is for you! Comprising the dedicated filter holder and a bracket for attaching 8"-wide rectangular filters, this WonderPana XL FreeArc Core Filter Holder and 8" Bracket from Fotodiox enables attaching 186mm threaded filters and caps to the lens, which itself lacks filter threads, and the included bracket can be added for working with 8"-wide square and rectangular filters. Once assembled, the entire system rotates a full 360° for flexible placement of the filter in use. The Fotodiox WonderPana XL 8" Holder Bracket is a two-piece assembly designed to be used in combination with a Fotodiox WonderPana XL FreeArc Core Unit. When attached it then allows for the convenient use of two 2.5 to 4.0mm-thick filters measuring 8in wide, or one 8in wide filter along with one 186mm round filter behind it. The WonderPana 8" Holder Bracket features a lightweight, aluminum-alloy construction that has a corrosion-resistant, black anodized finish for durability. A rigid pouch is included for storage and transport. 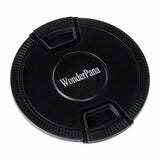 • The WonderPana you see on this page is custom engineered to fit the Sigma 12-24mm f/4 DG HSM Art Lens. 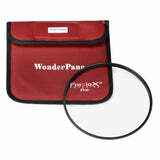 It will not fit other lenses, so it is very important that you chose the correct Wonderpana Core system for your particular lens model.